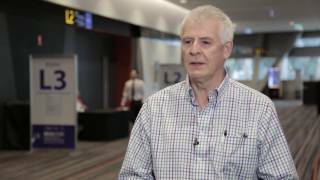 Ian Hewson, BDSc, FICD, FADI, FPFA of Alfred Hospital, Melbourne, Australia talks about his treatment journey after being diagnosed with low grade follicular lymphoma (FL). Side effects from 6 cycles of CHOP treatment included peripheral neuropathy and overall feeling of being unwell. Dr Hewson mentions that sometimes it is better not to treat until disease progression, as treatments are associated with side effects like losing hair. A discussion with a clinician about wait and watch is recommended to address any doubts. Recorded at the Multinational Association of Supportive Care in Cancer (MASCC) and International Society of Ocular Oncology (ISOO) 2016 Annual Meeting on Supportive Care in Cancer held in Adelaide, Australia.